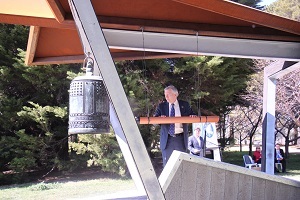 The International Day of Peace was celebrated on the shores of Lake Burly Griffin in Canberra with the ringing of the Peace Bell. The public ceremony included the UNIC Director talking about the Day and reading the Secretary-General’s message as well as the awarding of the ACT Chief Minister’s Rotary Peace Prize to the NGO, Women’s International League for Peace and Freedom (WILPF). Mr. Robert Tickner, AO, Ambassador for ICAN in his keynote address spoke about the need to rid the world of nuclear weapons and urged for the ratification of the Treaty on the Prohibition of Nuclear Weapons. In addition to the glorious spring sunshine, the audience were treated to the music of the Junior Concert Band from the ACT Instrumental Music Programme and A Chorus of Women. This entry was posted in UNIC Canberra Events and tagged International Day of Peace on October 3, 2018 by Julia Dean.